In 2012 Jodi and Tami filmed 3 live Ayurvedic Yoga classes in Goa India. These classes are specifically designed to harmonize our individual constitution and unify the body, mind and spirit. Ayurveda – “Yoga’s sister science,” teaches the philosophy of the 5 great elements as the foundation of three Ayurvedic principles called “Doshas.” We are all composed of Air, Space, Fire, Earth and Water. We are an intimate reflection of all that we see in nature. At different times in our lives, during the day or time of year we may feel an excess or deficiency in one or more of these elements. Yoga practice can bring our unique constitution into a state of balance. We can enhance our energy if we need or slow ourselves down. May you be inspired by these practices. This nourishing, and deeply relaxing, one-hour practice guides you through a series of restorative and yin postures. Gentle guidance is offered throughout the practice, and it is set to soft background music. Relax, rest and enjoy! Kapha – Earth/Water : This practice is detoxifying, invigorating and warming. Jodi & Tami guide you through an active Vinyasa Class. This strength building practice also creates inner heat and is truly energizing. We open the chest releasing stagnation from the system. A warming Pranayama is included and the practice ends with a seated meditation. his DVD, perfect for when you are travelling or do not have time to go to the studio. 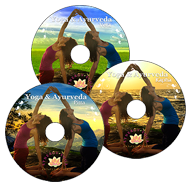 This DVD includes two 1- hour vinyasa yoga practices, perfect for all levels of practitioners. You may choose an instant MP4 digital download of the Synergy Yoga DVD or we can send you a hard copy of the DVD by mail.